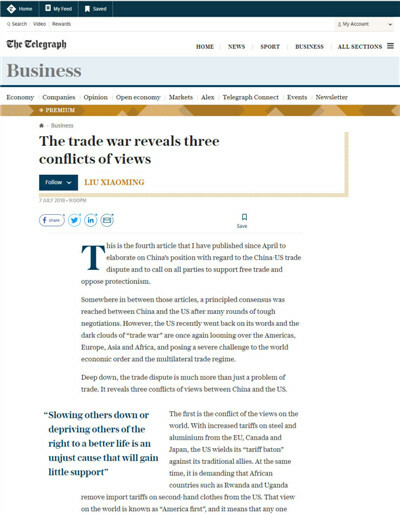 This is the fourth article that I have published since April to elaborate on China’s position with regard to China-US trade dispute and to call on all parties to support free trade and oppose protectionism. Somewhere in between those articles, a principled consensus was reached between China and the US after many rounds of tough negotiations. However, the US recently went back on its words and the dark clouds of “trade war” are once again looming over the Americas, Europe, Asia and Africa, and posing a severe challenge to world economic order and the multi-lateral trade regime. Deep down, the trade dispute is much more than just a problem of trade. 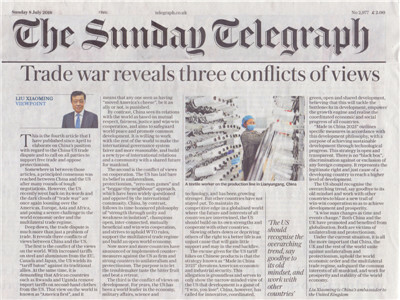 It reveals three conflicts of views between China and the US. The first is the conflict of views on the world. With increased tariffs on steel and aluminium from the EU, Canada and Japan, the US wields its “tariff baton” against its traditional allies. At the same time, it is demanding that African countries such as Rwanda and Uganda remove import tariffs on second-hand clothes from the US. That view on the world is known as “America first”, and it means that anyone seen as having “moved America’s cheese”, be it an ally or not, is punished. By contrast, China sees its relations with the world as based on mutual respect, fairness, justice and win-win cooperation, and aims to safeguard world peace and promote common development. It is willing to work with the rest of the world to make the international governance system fairer and more reasonable, and build a new type of international relations and a community with a shared future for mankind. The second is the conflict of views on cooperation. The US has laid bare its belief in unilateralism, protectionism, “zero-sum games” and “beggar-thy-neighbor” approach, which have been widely questioned and opposed by the international community. China, by contrast, follows its time-honored philosophy of “strength through unity and weakness in isolation”, champions open, inter-connected, mutually beneficial and win-win cooperation, and strives to uphold WTO rules, support the multilateral trade regime and build an open world economy. Now more and more countries have announced or implemented counter-measures against the US as firm and strong counters to unilateralism and protectionism. The purpose is to let the troublemaker taste the bitter fruit and beat a retreat. The third is the conflict of views on development. For years, the US has been a world leader in economy, military affairs, science and technology, and has been growing stronger. But other countries have not stayed put. To maintain its competitive edge in a globalised world where the future and interests of all countries are intertwined, the US should build on its own strengths and cooperate with other countries. Slowing others down or depriving others of the right to a better life is an unjust cause that will gain little support and may in the end backfire. The excuse given for US tariff hikes on Chinese products is that the strategy known as “Made in China 2025” threatens American economic and industrial security. This allegation is groundless and serves to only show the narrow-minded view of the US that development is a game of “I win, you lose”. China, however, has called for innovative, coordinated, green, open and shared development, believing that this will tackle the bottlenecks in development, empower the growth engine and realise the coordinated economic and social progress of all countries. “Made in China 2025” outlines specific measures in accordance with this development philosophy, with a purpose of achieving sustainable development through technological progress. This strategy is open and transparent. There is no “black box”, discrimination against or exclusion of any foreign company. It represents the legitimate right and just cause of a developing country to reach a higher level of development. The US should recognise the overarching trend, say goodbye to its old mindset and work with other countries to blaze a new trail of win-win cooperation so as to achieve development and prosperity. “A wise man changes as time and event change.” Both China and the UK have promoted and benefited from globalisation. Both are victims of unilateralism and protectionism. Under the current situation, it is all the more important that China, the UK and the rest of the world unite against unilateralism and protectionism, uphold world economic order and the multilateral trade regime, safeguard the common interests of all mankind, and work for prosperity and stability of the world economy.